I know that the answer to this question is a resounding YES! If you can use a pair of scissors and can print an "S," you have the necessary skills to shape this beautiful loaf. This recipe was developed by a home baker just like you and me. Dianna Wara of Washington, Illinois developed this recipe and entered it in the very first National Festival of Breads in 2010. Dianna won the grand prize at the festival that year for her Tomato Basil Garlic Pane Bianco and King Arthur Flour published the recipe on its web site where you can still find it today. This recipe makes two generous loaves, perfect for sharing with a friend. After mixing and kneading the ingredients for the dough, let it rise until doubled in volume. Turn the dough out of the bowl and divide it in half. Did I mention that this dough is an absolute dream to work with? It rolls out easily and cleanly yet it is sturdy enough for you to move it from the rolling surface to the baking sheet without tearing or falling apart. Using your rolling pin, roll out half of the dough in a large 22 inch by 8-1/2 inch rectangle. As you can see from the photo, I used my silicone rolling mat from King Arthur Flour. This mat is one of my essential baking tools. Why? Well, the measuring tape along the bottom and side of the mat make it easy to roll dough to the proper size. AND cleaning up my work space is easy - just wipe with soapy water, rinse, dry and roll it up until next time. After rolling out the dough, it's time to add the ingredients for the filling, one layer at a time. I put the filling ingredients right to the edges of the dough. First, sprinkle on the granulated or powdered garlic. The garlic is followed by the shredded cheese, then the fresh basil followed by the sundried tomatoes. 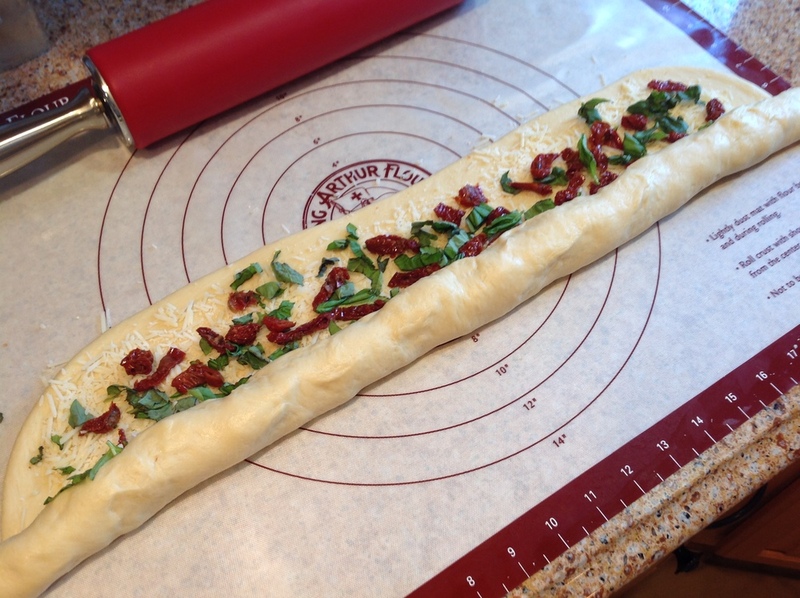 Baker's tip - use your kitchen shears to quickly and easily chop the basil and sundried tomatoes. You also need to drain the tomatoes and blot off the olive oil they came in before cutting them for the filling. Don't cut the basil and tomatoes too small. You want them to be discernable in the finished loaf. Now that we added the filling ingredients, it's time to shape. Starting with the bottom long edge, roll the bread dough as you would a jelly roll towards the top long edge. Try to keep the roll a tight as you can. 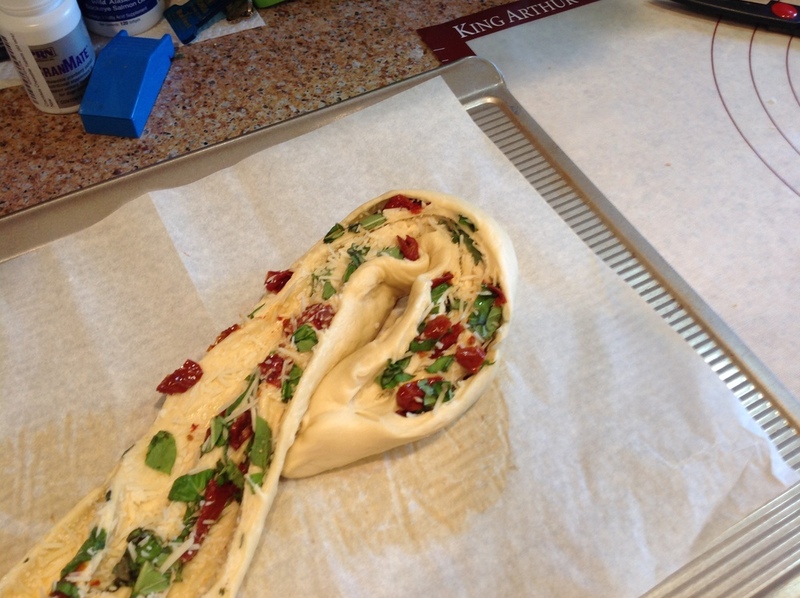 Pinch the top edge together with the roll to seal the dough. Then, lift the roll and transfer it to a parchment-lined baking sheet. Be sure to place the roll seam side down. Your rolled dough is quite long, too long for the baking sheet, so you want to place the roll diagonally as shown in the photo. The dough roll will still be too long for the baking sheet but that's okay. You'll see why in a second. Using your kitchen shears, cut the dough roll starting about a half inch in from the end. Cut down the length of the roll to the other end, leaving a half inch uncut. As you cut the roll, do not cut all the way through the bottom. You want to keep the bottom intact. The layers will fall open and look messy. Starting with the top end, pull the sides up and lift the end, bending it down to the center of the loaf to shape the top curve of the "S." Tuck the end under the loaf. Do the same thing with the bottom end of the dough roll, bending it up to the center of the loaf to form the bottom curve of the "S." Tuck this end under the center of the loaf. Congratulations!! You just shaped your loaf! That wasn't so hard, was it? After rising a second time, your breads are ready for the oven. Bake at 350 degrees for 35-40 minutes. Rotate your loaves from top to bottom, bottom to top after 20 minutes of baking. If the loaves look too brown, tent them lightly with foil. Your loaves are done when they register 200-205 degrees in the largest part of the loaf with an instant read thermometer. Your house will smell divine as these loaves bake. Yum! I know that it is difficult, but please let your breads cool a bit before slicing them. Just look at your handiwork and give yourself a well served pat on the back. You did it!